How much is Aaron Donald Worth? 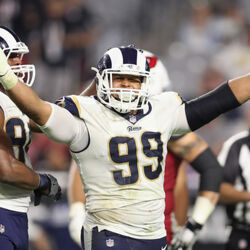 Aaron Donald net worth and salary: Aaron Donald is an American professional football player who has a net worth of $40 million. Aaron Donald was born in Pittsburgh, Pennsylvania in May 1991. 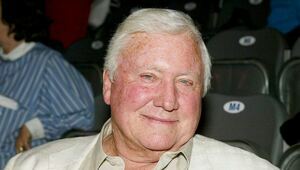 He is a defensive tackle who played at Penn Hills High School. Donald played his college football at Pittsburgh where he was second-team All-Big East in 2011 and first-team All-Big East in 2012. In 2013 he was first-team All-ACC and a unanimous All-American and won the ACC Defensive Player of the Year, the Bronko Nagurski Trophy, the Chuck Bednarik Award, the Lombardi Trophy, and the Outland Trophy. Aaron Donald was drafted #13 overall by the St. Louis Rams in the 2014 NFL Draft. He has played his entire career with the St. Louis / Los Angeles Rams through the 2017 season. Donald was named NFL Defensive Rookie of the Year in 2014 and AP NFL Defensive Player of the Year in 2017. He was a first-team All-Pro in 2015, 2016, and 2017 and a Pro Bowl selection in 2014, 2015, 2016, and 2017. 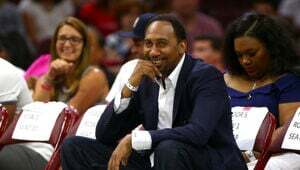 In 2018 he signed a six year deal for $135 million. An impressive $87 million of his $135 million contract is guaranteed. 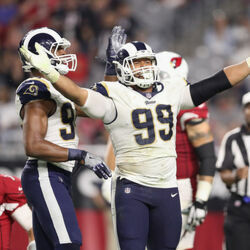 What Exactly Are The Rams Doing With Aaron Donald? 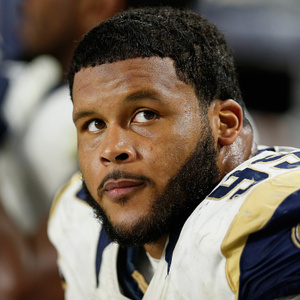 Could Aaron Donald's Holdout Last All Season?